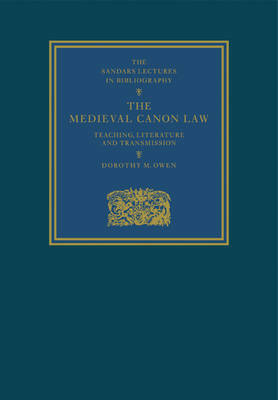 Knowledge of the canon law was essential for the medieval ecclesiastical administrator, and teaching in canon law was provided in all western universities in the Middle Ages. This study examines the provision for students (especially in Cambridge), the choice of available textbooks, and the collections of legal books made by the university and colleges and by private individuals. Dr Owen notes opportunities for the employment of canonists, and discusses a group of formularies and notebooks compiled by scholars active in the Church courts. Official teaching of canon law ceased at the Reformation, but the study continued in the faculties of civil law; medieval texts were reissued and many new guides to the current practice of Church courts written.